We know how important it is to sleep soundly. That’s why our new Serene® foam and Encased Coil with Serene® foam mattresses respond to the contours of your body for personalized comfort. 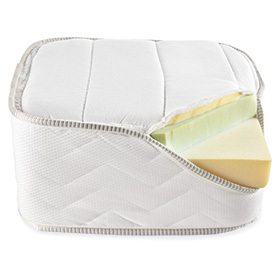 The innovative foam technology provides a better sleep experience than traditional memory foam. See what’s inside. Try your new mattress for up to 120 nights. If you decide you want to exchange it for a different mattress or simply return it, we’ll come to your home to swap it out or pick it up for free. Not sure what kind of mattress you want? We offer four mattress types with 11 comfort options in all and our handy online tools make it easy to compare. Shop by mattress type or compare by comfort with our mattress guide. If you're shopping in our stores, an expert Design Associate will be happy to answer all of your mattress questions.